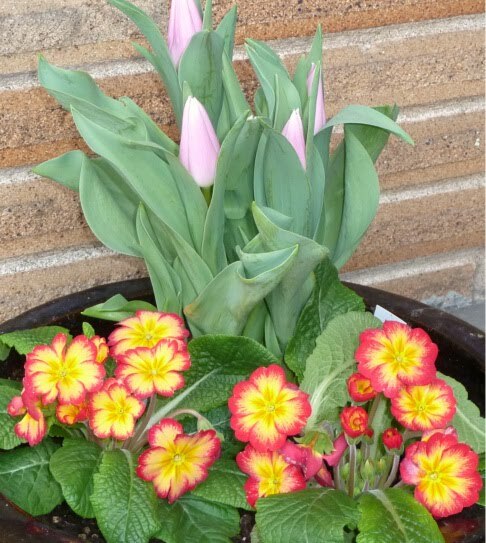 Although we are nowhere near spring and the temperatures at night in Seattle have been somewhat low and chilly in the 20s, my springtime flowers are doing just dandy. The ones pictured here are under some shelter and don't seem to be minding the cold, but I have other ones planted in an area that is a little more exposed so I started covering them at night and will continue doing so until the night time temperatures pick up a little. I certainly can't complain given the fact that half the country seems to be under snow. The ground still stays frozen during the day in spots, which makes doing any other kind of planting difficult, but these are all in containers, so it's not much of an issue. 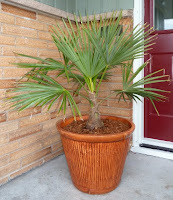 I repotted my new windmill palm. These hardy palms can withstand low temperatures of the kind we never get around here. 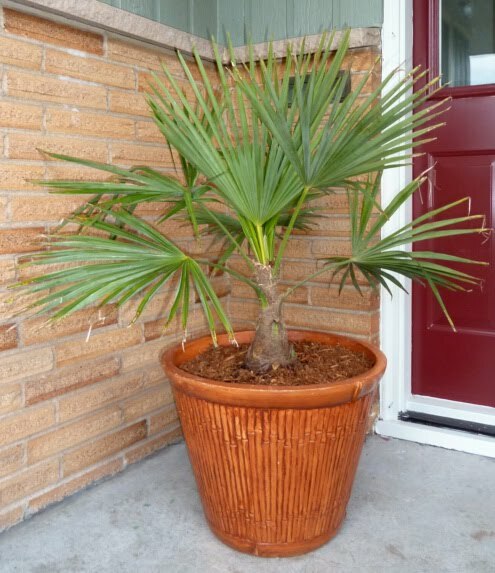 It's a fairly slow growing tree and this particular palm is very popular in North Seattle. It's nice to have a bit of tropical feel up north where pretty much all you see around our neighborhood are Japanese Maples, rhododendrons, azaleas and more rhododendrons. I don't mind a little variety. The house down the street has two windmill palms in the front yard that are definitely over the height limit but are in no way threatening anyone's views. They must have been planted when they built the house over fifty years ago because they are quite large and really work well with the architecture of the house which is a sort of Spanish colonial style. 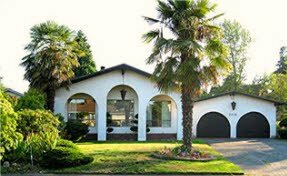 You wouldn't think you'd find this style of home in Seattle but it's not uncommon to see homes that are adobe or Spanish style in homes built between 1910 and 1960. In fact, there's an area near Greenlake in North Seattle that has a number of adobe homes that always catches me off guard when I go by them. In any case, I have a lot more yard work to do, I'm just waiting for the ground to thaw out a bit. I have a Winter Daphne I still need to plant as well as my elderberry. And that's the outdoor excitement around here! Nice! But I fear there is still a little Winter left. Jealous, jealous, jealous. We had -40 wind chills... less than 36 hours ago, here. PS. May I ask how you got a url without the "blogspot" label in it? Mine still has that in the url and I'd love to get rid of it. I am totally jealous of your growing plants!